Scientists of the ICN2 Physics and Engineering of Nanodevices Group, led by ICREA Prof. Sergio O. Valenzuela, have contributed to the literature on spin caloritronics with a focus on the effect of thermal gradients on spins in graphene. The paper titled "Thermoelectric spin voltage in graphene" was published this week in Nature Nanotechnology, with lead author Juan F. Sierra. Spin caloritronics is an emerging field that studies the interaction of spin and heat currents in different materials. Spin is an intrinsic property of electrons, which, like charge, can be used to store and transport information. Researchers are looking at different ways to generate spin currents and exploit them in a future generation of electronic devices. However, sustaining them over the distances needed is a challenge. Heat currents offer a possible solution. In this paper, ICN2 researchers turned their attention to graphene. Able to transport spin efficiently over long distances, this material is already the focus of much attention in spintronics. And given that graphene is known to present large thermoelectric effects and extraordinarily long carrier cooling times, the application of heat currents was promising. Using a precise experimental setup, the researchers were able to independently control spin and heat currents in graphene. They observed that the presence of a thermal gradient significantly enhances the spin signal, and that it does so around the charge neutrality point. 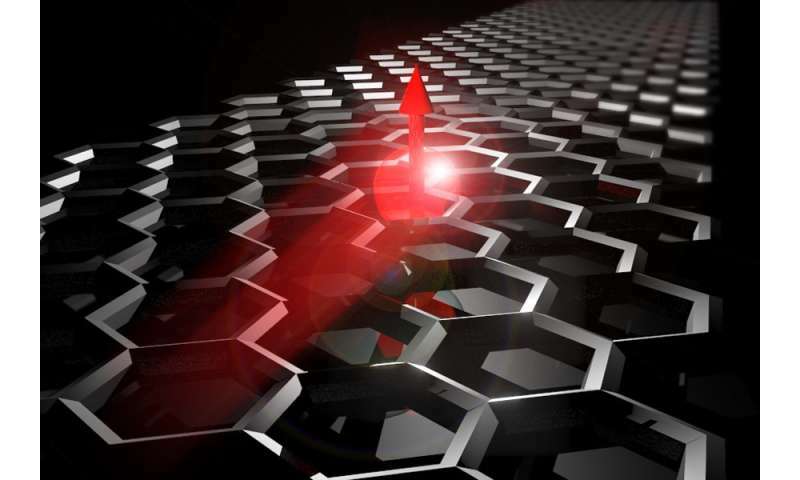 Overall, graphene's baseline spin signal was increased by around 30 percent upon application of a heat current, giving a total signal two orders of magnitude greater than anything previously reported for thermal effects in metals. Such a large thermoelectric spin signal is the combined consequence of graphene's large Seebeck coefficient, which governs the scale of the thermoelectric response, the fact that this coefficient varies strongly with the Fermi level, and the presence of hot carriers. Indeed, it is these hot electrons that cause thermal gradients on a scale that allow observation of this thermoelectric effect on spin. These results represent unprecedented advances in our understanding of spin caloritronics, holding promise for technological advances in the form of devices able to control and sustain spin currents over useful distances through the application of a heat current.